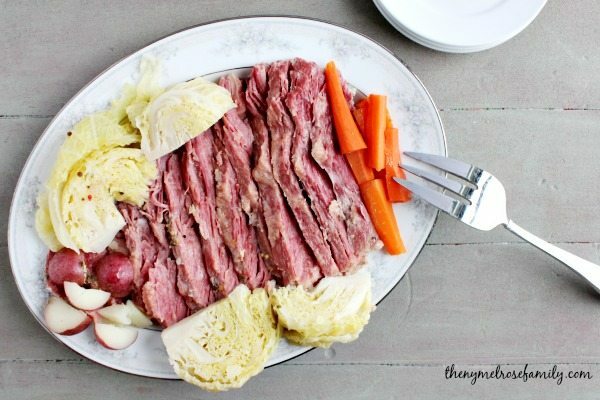 There is nothing more traditional for Saint Patrick’s Day than a corned beef and cabbage recipe. Our corned beef and cabbage recipe is a simple recipe that requires little to no experience in the kitchen. It’ll make your Irish descendants proud! St. Patrick’s Day is just about right around the corner, which seems odd this year considering we are still covered in snow. I usually always associate St. Patrick’s Day with the very early signs of green. Not necessarily Spring, but with a little bit of green starting to come into the grass in NY. I doubt very much that I’ll be seeing that this year though. 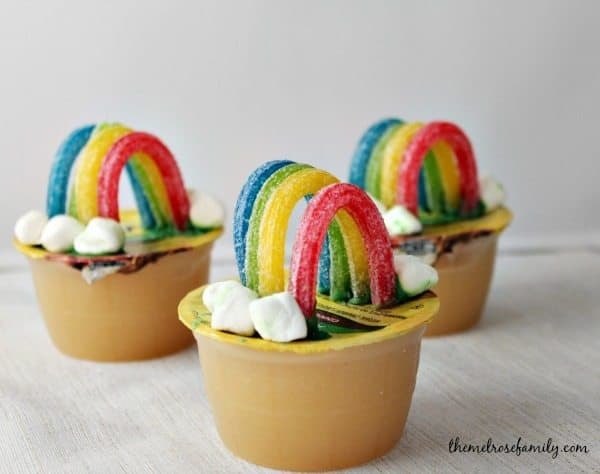 I plan on making my own green though. This Irish girl loves her Kelly green and I have my girls as well as my husband wear their green proudly ever year. 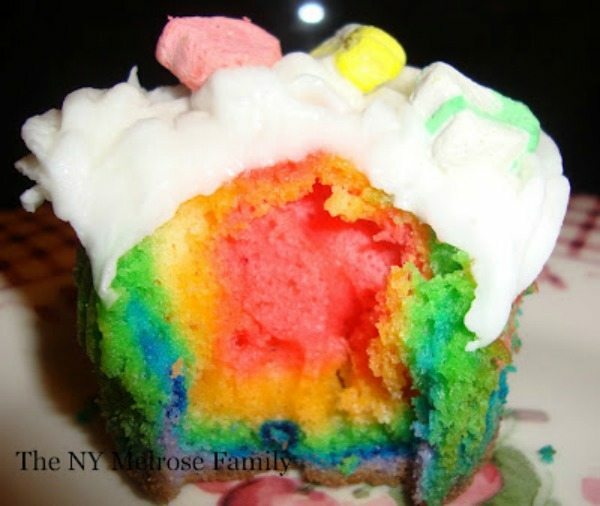 I have quite a few traditions that I’ve created with my girls for St. Patrick’s day. 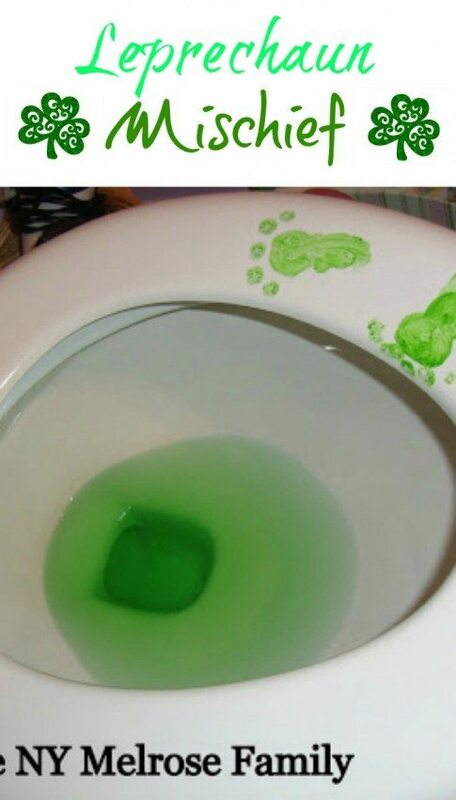 Our favorite by far is our Leprechaun’s Mischief, which you have to read. Another tradition is our flavorful Corned Beef and Cabbage recipe, which I recently perfected on a tip from a lady at the grocery store. As a child I was never a very big fan of Corned Beef and Cabbage. I can remember my brother wolfing down piece after piece of the corned beef, but it wasn’t enticing to me. The cabbage was even worse. I think it was more the texture for me than anything else. My taste buds have definitely changed, but I’ve also tweaked our traditional Corned Beef and Cabbage recipe to include a bottle of beer. A lady saw me trying to decide on the cut of corned beef and took it upon herself to tell me that it was absolutely necessary to add a bottle of beer when I boiled my corned beef. Some people might have been taken aback by her forward nature, but I gladly accepted tips about food. Since I was such a late bloomer to cooking, I’m always intrigued by what others have learned in their long history of cooking. I am so glad that she did stop me because it definitely added a little extra flavor to the entire meal. I used a flat cut corned beef, which was what the butcher suggested. I later found out that my mom usually buys a round cut, which has more fat on the beef adding to the flavor. Add a bottle of beer to the water while boiling the corned beef and cabbage. A round cut of corned beef has more fat and more flavor, while a flat cut of corned beef has much less fat. Slice across the grain of the corned beef so that the pieces of corned beef are chewable. Boil the corned beef for 50 minutes per each pound. Wait to add the corned beef, red potatoes and carrots in the last thirty minutes. Our corned beef was extremely flavorful and I’m not usually a fan of fatty pieces of meat so I most likely would still stick with the flat cut. The process though for both pieces of meat will be exactly the same. Just be sure to slice across the grain of the meat. Otherwise, you’ll end up with meat that is not chewable. 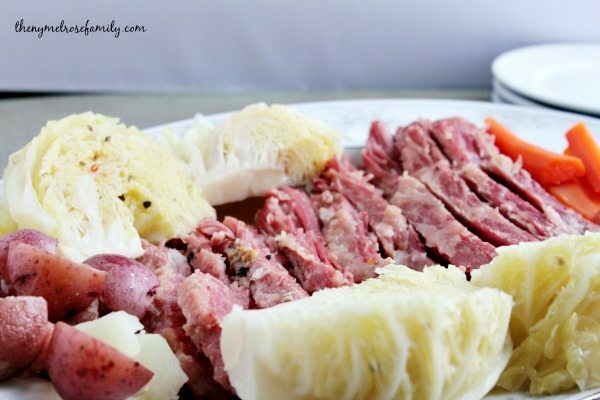 A flavorful and easy corned beef and cabbage recipe that requires minimal ingredients. 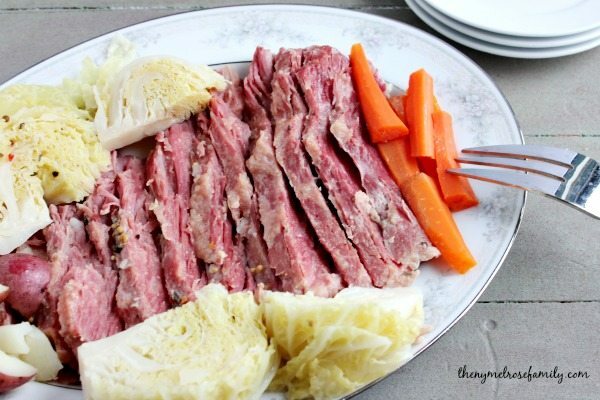 A tender and tasty Corned Beef and Cabbage recipe perfect for St. Patrick's Day. Boil the corned beef in the spices (that come with the corned beef) with the beer and water for 50 minutes per pound. In the last 30 minutes of cooking add in the cabbage, carrots and red potatoes. 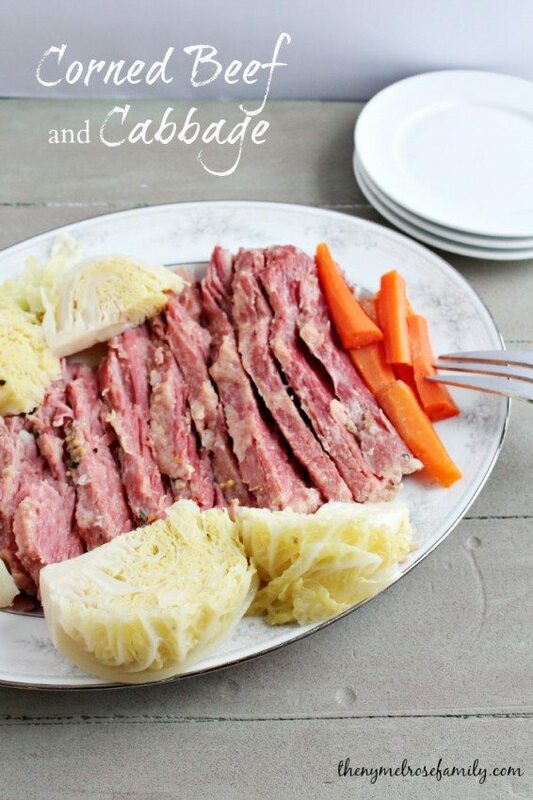 The corned beef should be 145 F in the center and you want the cabbage, carrots and potatoes soft. 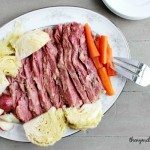 If you liked this Corned Beef and Cabbage recipe you might also like…. 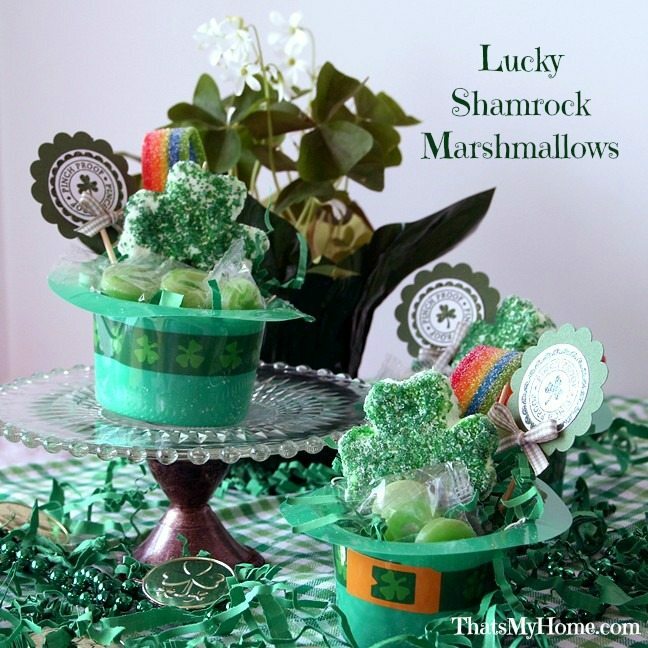 From left to right: Lucky Shamrock Marshmallows, Lucky Charm Treats & Rainbow Snack Cups. Made this tonight. My husband loved it! It will be an annual thing now.